These are some of the examples of cryptocurrency hacks, and you too could be a victim of it, if you didn’t act fast. It is ten years since Bitcoin was launched and in this period it has forced many people around the world to rethink about their definition of money. Bitcoin is the first fully functional cryptocurrency and self-sovereign money that anyone can hold, transact and carry around across borders. But this feature of Bitcoin comes with responsibility as you need to take care of Bitcoin private keys to hold it safely. And many people around the world have failed to do so for Bitcoin and other cryptocurrencies. Is this just laziness or lack of education? And when it has been 5+ years since the launch for first hardware wallet, i.e., Trezor, your laziness and Bitcoin hacks are not less than surprising. Trezor one and Terzor Model T are the two hardware wallet products from SatoshiLabs, a Czech Republic-based company. The company has pioneered the era of hardware wallets since its first product launch in 2013. The hardware device itself is a small flash drive like item with an OLED screen on it. It also has two on-screen buttons to help you navigate the interface. The beauty of the device is that you can connect it even with a malware infected laptop or device because ultimately all transactions are manually authorized from the device screen. You also get your seed words while using Trezor wallets which keeps you in control of your funds always and for extra security, you have the option to set PIN and passphrases. And not only this but with Trezor hardware wallets you also get the opportunity to get forked cryptocurrencies. Like in 2016-2017 Trezor wallet holders got Bitcoin Cash, Ethereum Classic and Bitcoin Gold as free money. Lastly, the main reason to have a Trezor device is to control your seed or private keys of cryptocurrencies and not get hacked by keeping them on exchanges. PS: Trezor Model T and Trezor One can store hundreds of cryptocurrencies that too in billions of dollars. So, in short, having a hardware wallet like Trezor is the best bet you can play with almost 100% certainty that your crypto funds will remain secure because ultimately Trezor devices are any day a better option then mobile and desktop wallets. That’s why we want to make you aware about the possibilities Trezor hardware wallets bring with themselves and hence listing here the trezor wallet supported coins. These are only some of the currencies supported by Trezor devices, but in reality, you can store more than 700+ coins, tokens, and cryptocurrencies on them. 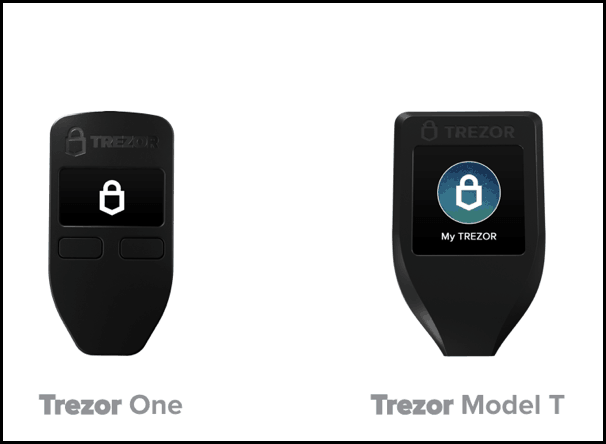 But if you noticed there are two models of Trezor wallet – Trezor One and Trezor Model T.
So naturally, the question arises, which one to you should buy? Well, before answering this question, please understand that in terms of security both are excellent. However, Model T goes a notch above just because of its design and software that it is using. thus ultimately making it harder for an attacker to take your funds even if the attacker is in possession of your device. So, if you are someone who wants to spend a little less and is focused on a few popular cryptocurrencies like BTC, ETH, LTC, ETC, ZEC, etc. should go for Trezor One. And anyone who wants more options and storage for many more currencies including the popular ones should opt for Trezor Model T because in terms of coin support Trezor model T is future ready and supports many currencies. 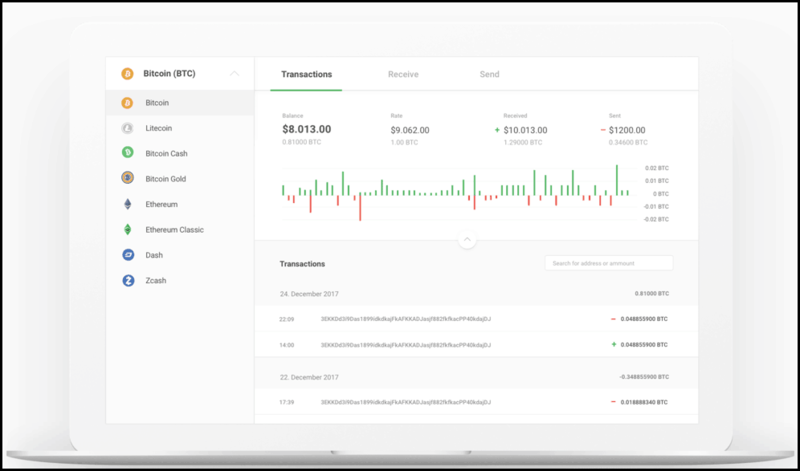 Another benefit of using Trezor devices is that you get to access your coins through their natively developed Trezor Bridge desktop app, which gives you the feeling of using a desktop wallet but in reality you store your funds on the hardware device only. So this is a feel-good user experience of using Trezor devices. Moreover, Trezor also integrates with other third-party wallets to give you a seamless experience of using certain cryptocurrencies on Trezor. But this is not true for all the supported currencies as Trezor app’s native integration is still being worked for few of them. That’s why having integration of 3rd party apps can be a handy thing here as it still allows you to access those currencies on your hardware device. One such example is Cardano, it is not yet supported by Trezor bridge, but if you want to store Cardano (ADA) on Trezor, then you can very well do so by using AdaLite wallet by Cardano foundation. Ripple (XRP) No wallet yet. Tether (USDT) No wallet yet. EOS (EOS) No wallet yet. Tron (TRX) No wallet yet. Monero (XMR) No wallet yet. If you are a long term Bitcoin or crypto HODLer, then Trezor devices are best in terms of safety of your funds. And in my opinion, only long term holders benefit the most from any investment. I also accept that Trezor had had its fair share of criticism when certain bugs were found in their device, but you need not worry about those because Trezor has already fixed them. Also, many of the attacks require the attacker to have physical access to your device, and this is not an easy thing to do. That’s why hardware wallets like Trezor are any day better than cryptocurrency exchanges for storing your crypto funds. Lastly, Monero’s Trezor support integration is also over so you can now use Monero cryptocurrency too on your Trezor devices. So that’s all from our side in this Trezor supported coins article and next in our series is the Ledger Nano S supported coins article to help you choose another great cryptocurrency hardware wallet.